With the news that New Belgium Brewing would start distributing their beers in Richmond this fall, craft beer lovers are anxiously awaiting the arrival of the Colorado giant. 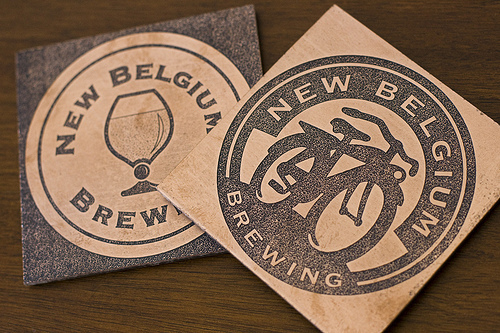 With no frame of reference, I decided to take a look at New Belgium’s beer list. To say the list is big would be an understatement. New Belgium boasts twenty year round beers which does not include their 4 seasonals and 5 collaboration beers. From where I am sitting, 29 beers is a very impressive numbers. It would be easy to say I’d like to try all of them, but I’ll try and narrow it down to just a few. As a homebrewer, I have to respect co-founder Jeff Lebesch for bringing his first homebrew to market. It uses Sterling hops so as far as I’m concerned that makes it awesome. It is probably New Belgium’s most well known beer. Of course, it makes the list. They call it an Enlightened Black Ale. With all the studying of centuries-old Belgian texts, I expect it to take me back in time. That is just a little of what could be in store for Richmond craft beer lovers. Like the coasters in the picture, check them out over at Copper Blog to scoop them up.